AFC - Man and Wolves Eternal Adversaries? Wolves, they were here on earth long before man; they evolved over time as did man, but wolves remained as an integral part of their natural environment. Man in contrast wanted to dominate the natural world and have "dominion over it." That human characteristic has endangered the wolf in some areas to extinction, and to this day threatens its existence in all its natural habitats. Loren Eiseley, a well know anthropologist, may have expressed the condition in one sentence, "The wolf and man have ever been at war because at heart they are alike." Man has both feared and admired the wolf through the ages. In literature, especially in the fable genre, canis lupus was most often depicted as a vile creature; as every one knows who has read "Little Red Riding Hood." As saner minds prevailed and humanity grew out of the dark ages, the wolf gained some measure of acceptance. He even was hailed as a "Noble" creature at times, and in the lore and ritual of indigenous people he was given powerful status, which still remains to this day. Today the survival of the wolf in the wild, in its natural environment, is by no means guaranteed. The wolf needs what man wants, territory to live and hunt in. Man has decided to eradicate that competition throughout the centuries. At this time, the State of Alaska has declared all out war on wolves. "State officials have begun issuing permits for aerial hunters to kill wolves in parts of Alaska in an effort to boost moose and caribou populations," from an Alaskan newspaper article. 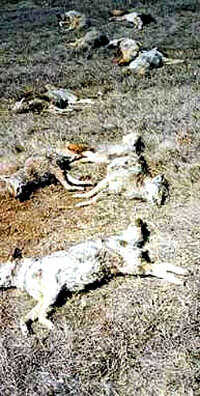 This is happening in spite of Alaskans voting aerial killing of wolves down twice (1996 and 2000). 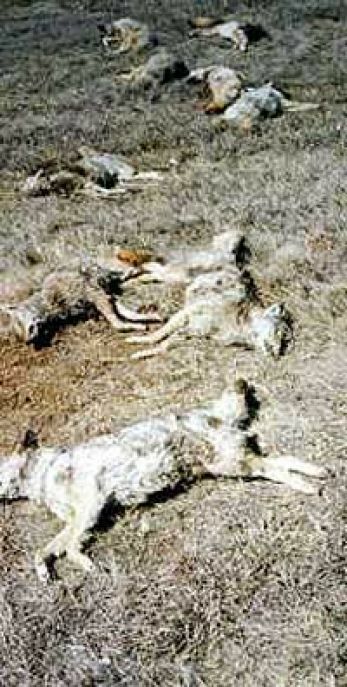 The killing of wolves by aerial shooting is a desperately cruel way to kill the animals. They are chased by planes until they are completely exhausted and drop to the ground; the plane lands and the hunters execute the animal. More than sixty "sport" hunters have applied for permits to aerial hunt wolves in 2005. One-hundred-seven wolves were killed last year by aerial hunters, when the Alaska Board of Game resumed the practice of aerial killing. Alaska's Department of Fish and Game is targeting six-hundred wolves for destruction in the coming year, all in an effort to supply sport hunters with trophy animals. In the past six years more than 9,000 wolves were killed through hunting and trapping in Alaska. How far will the State of Alaska go in its effort to destroy one of its native inhabitants? Perhaps the trophy hunter and the "sportsman," who kills predators like the wolf, must be helped as one does a child. He must mature beyond the point of his egocentric world view and realize that it is grossly selfish to satisfy his immediate gratification by killing wolves for sport. "Wolves are the keepers of the wild. We have a right to their company."